Layer styles, layer effects, liquify tools, and a brand-new image-editing engine highlight the new features in Pixelmator 3.0 FX, a major upgrade to the OS X image-editing package long seen as a lean, mean—not to mention low-priced—competitor to Photoshop. Pixelmator 3.0 FX is an upgrade from version 2.2 Blueberry, equipped with an enhanced editing engine that supports new features in OS X Mavericks and promises faster performance. Nondestructive layer styles include shadows, inner shadows, gradients, outlines, and reflections, which you can create freehand or from built-in presets. A compact Styles palette makes it easy to apply and tweak styles for unique compositions. You can also combine a set of effects to create and save your own custom-made Layer Style presets. 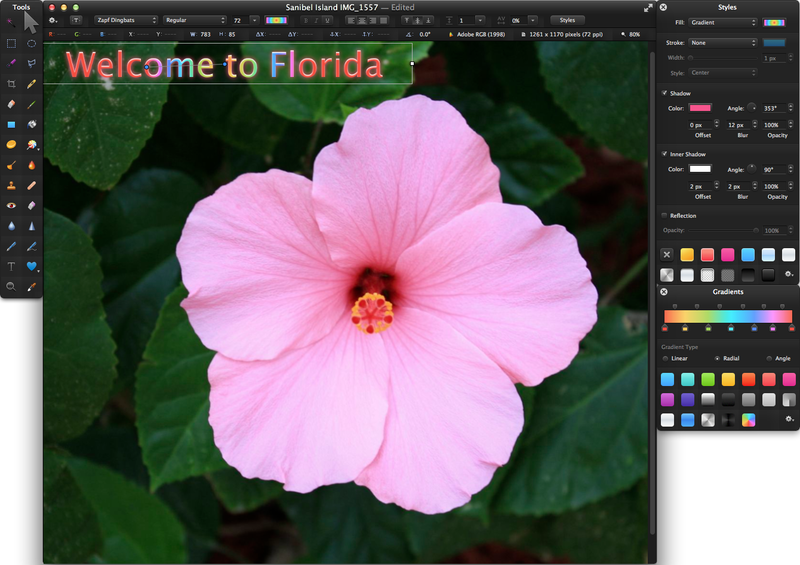 Do mean things to a flower or to a kid’s face with the new Liquify toolset. Now, Pixelmator also lets you destroy the faces and bodies of your friends and loved ones, or perhaps some inanimate object, with the new Liquify tool. You can twist portions of an image, add artistic detail, or even distort an entire image with the new Warp, Bump, Pinch, and Twirl commands. Click or drag to enlarge, pinch, squeeze, or stretch parts of your images. Twist images for a grotesque look, or distort, transform, or create unusual details. 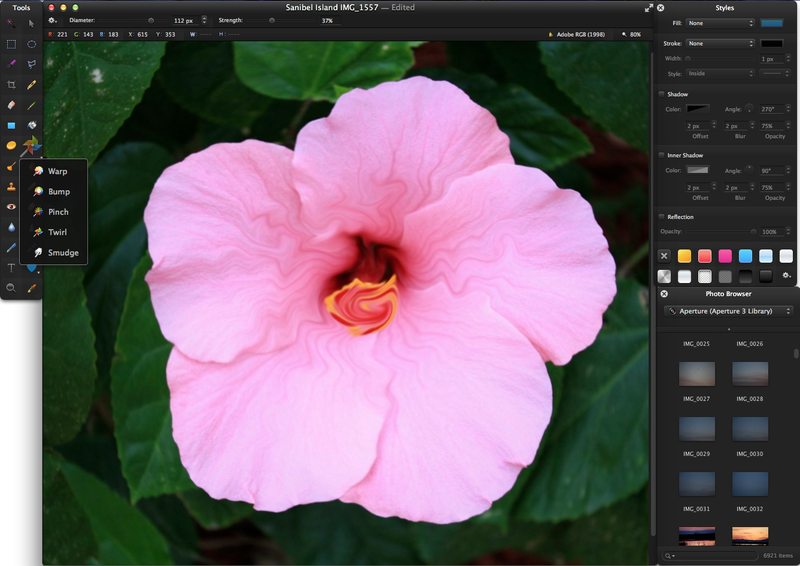 Pixelmator’s revamped imaging engine combines technologies such as Core Image, OpenCL, OpenGL, and Grand Central Dispatch to offer dramatically faster performance, according to the developers. Pixelmator says that this new version is 1.4x faster overall and up to 2x faster with complex compositions. Layer styles and effects are easy to apply, so you can create shadows, reflections, gradients, and more. Taking advantage of new features in OS X Mavericks such as App Nap and Compressed Memory, the latest Pixelmator is designed to be more responsive and power-efficient than the previous version. Tags in OS X Mavericks will help you organize and find Pixelmator documents quickly. With the enhanced multiple-display support, you will have more flexibility to open Pixelmator windows the way you want to, on the display you choose, so you can run the program on every display connected to your Mac the same way as on your primary display. Pixelmator 3.0 FX is available now on the Mac App Store for $30 or as a free upgrade to current users who purchased it on the App Store. Check out a trial version for 30 days free of charge.